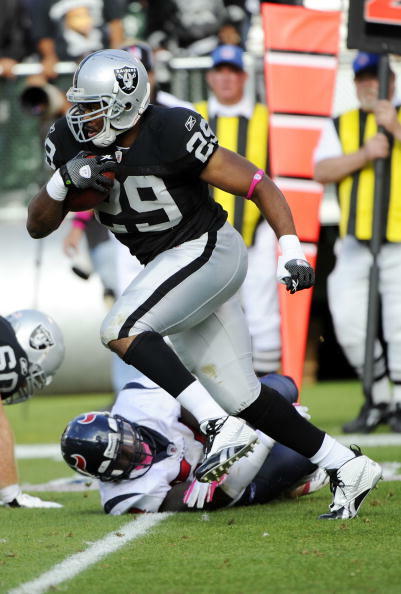 As the clock continues to tick towards free agency, it’s becoming more and more apparent that the Raiders are not going to put the franchise tag on running back Michael Bush, meaning he’ll hit the market once free agency starts. Bush and his future with Oakland has been maybe the biggest offseason question, that was until the team dismissed Hue Jackson and finally got a new coach in Denver DC Dennis Allen. Back to Bush, the Raiders should seriously consider putting the tag on him, making sure that there’s almost no shot of him going anywhere. Franchising Bush would guarantee him a contract of about $7.7 million for next season. It’s a huge number for a player that is not even considered to be the best player at his position on the team. But, while that distinction goes to Darren McFadden, am I not the only one really concerned about how fragile McFadden has been in his NFL career? Last season the former Razorback played in just 7 games, and the season before that 13. As a matter a fact, he’s played in just 45 games in 4 seasons, that’s about 11 a year, meaning he’s missing an average of 5 games per season. The Raiders are not a team that can afford to not have someone that can carry the ball for five games a season, and I felt Bush last season stepped up and played well rushing for 977 yards, including two games over 100 yards, one of which was a 157-yard game vs the Chargers. There’s an understanding that Taiwan Jones, who makes just $465,000, could be the full-time backup for McFadden, but losing Bush would hamper this team and its depth at the RB spot big time. The offense is going to be in a flux in 2012, and the fact that Bush ran for nearly 1000 yards and also caught 37 balls for 418 yards would make that new offense run a lot better with him there. If Bush bolts, there’s going to be major interest from teams like Cincinnati, Cleveland, Pittsburgh, Detroit, Washington, and Kansas City. Work out a long-term deal, get him for $3-4 mil a year, and know that if McFadden goes down for any long length of time, you have a back behind him that can carry the load. The RB tandem right now was leading the league in rushing before, DMC was hurt, right? Best thunder and lightning corps in the NFL. Gotta keep it, well… running.